Yahoo made a big splash by hiring Marissa Mayer as its CEO. The bloom has come off the rose a bit. As is sometimes the case with CEOs who are celebrities or otherwise insulated from common criticism, Mayer has been defended heartily for a few years for her decisions and record. …and then to an excoriation of the Mayer “strategy” overall, from the hire to the actual execution of change within Mayer’s tenure. And, it’s a bloodbath. When a “transformative” CEO’s tenure can be summed up as diametrically opposed to the “story” that got her hired, you know one thing: The CEO hasn’t delivered. 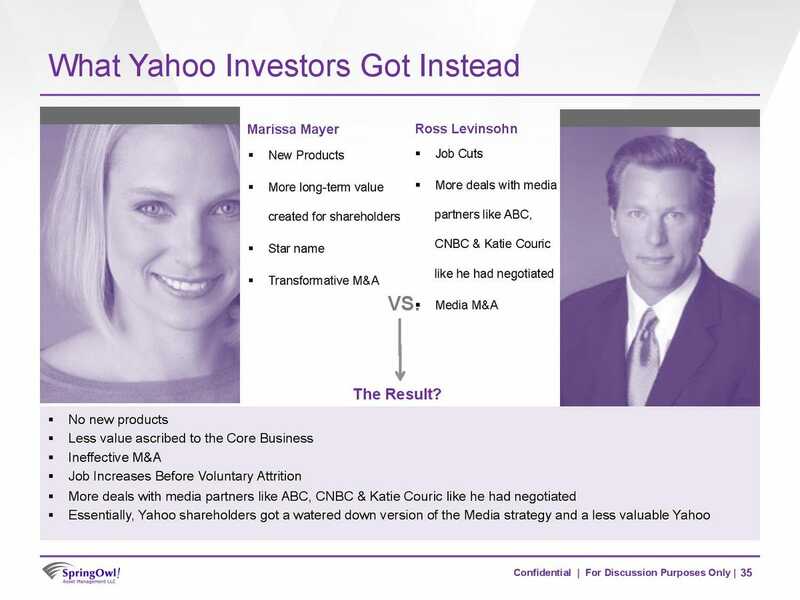 Now, the Mayer story is getting a lot of play because of the potential severance package she stands to receive if Yahoo’s board actually fires her (valued at up to $110 million by some estimates). That’s all fine…A deal is a deal. But what is interesting here is that Yahoo has gone years with Mayer as its CEO, running a play that is clearly not what was advertised. Just look at the slide above. The point in this case is less about Yahoo and more about the perils of “story” sales from executives. Yahoo, in fact, is one tough turnaround situation. As Jackson outlines, remove the Alibaba stock holding and what you’ve got is a very, very sick business. What about “story” sales? Well, no matter how good the story, somebody is watching the results. Your CEO may “say” that new products are going to drive the company to new heights, but at some point that check has to be cashed. Did they deliver on new product sales? Did the video match the audio? Have you been sold a bill of goods? It’s an important question for shareholders everywhere. But, more importantly, it’s an important vignette for executives everywhere. When it comes to highly visible executive roles, a story can only go so far. At some point, the numbers will tell. At some point, the power of personality and persuasion will cross the threshold of shareholders’ own financial interests. Lincoln said it: You can’t fool all the people, all the time. At some point it becomes clear that somebody is watching. And when that is clear, you no longer own the “story,” dear CEO. The Yahoo case shows this in spades.